For many electronic application circuits we need constant voltage power supply source, when we design a electronic product we should keep in mind that different voltage standards are followed by different countries. 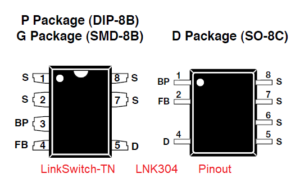 Here a universal input (85-265 VAC) and constant voltage power supply circuit (12 V, 120 mA) designed by using LinkSwitch-TN LNK304 from power integrations. 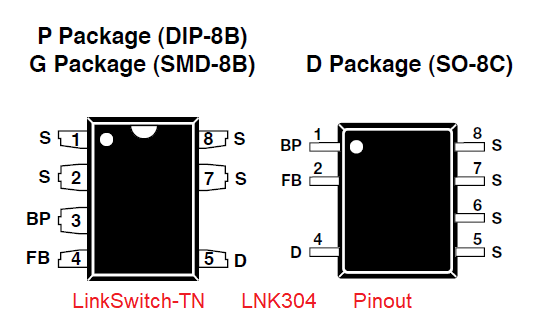 The LNK304 is a Lowest Component Count, Energy-Efficient Off-Line Switcher IC suitable for AC to DC buck converter applications and also switch mode power supply, due to its Universal input voltage range (85 VAC to 265 VAC) we can design transformerless power supply circuit without any complications. Following circuit is a development of LNK304’s typical application. IC LNK304 has many notable features and it helps to design low cost minimum component buck converter circuits, it has Fully integrated auto-restart for short-circuit and open loop fault protection. 66 kHz operation with accurate current limit allows low cost off-the-shelf 1 mH inductor for up to 120 mA output current and has Tight tolerances and negligible temperature variation. High breakdown voltage of 700 V provides excellent input surge withstand, refer datasheet for more details. In this power supply circuit design DIP-8B p package LNK304 is used, AC input supply voltage is given to Drain pin through R1 Fusible Resistor and D1 diode (it is for rectification) and L1 inductor. C1, L1 and C2 elements are forms filter at input stage. DC Output supply (12V, 120mA) derived from source pin with Bypass and Feedback circuit elements, D3,D4 and other components forms power processing stage at output. Here the output voltage regulation is maintained by skipping switching cycles, when the output voltage rises, the current into the feedback (FB) pin will rise. If this happens then subsequent cycles will be skipped until the current reduces feedback current. This circuit takes Universal input voltage range (85 VAC to 265 VAC). Provides 12V, 120mA DC output. Suitable for Appliances and timers. Suitable for LED drivers and industrial controls.